Make your power drill a powerful slate-cutting shear! 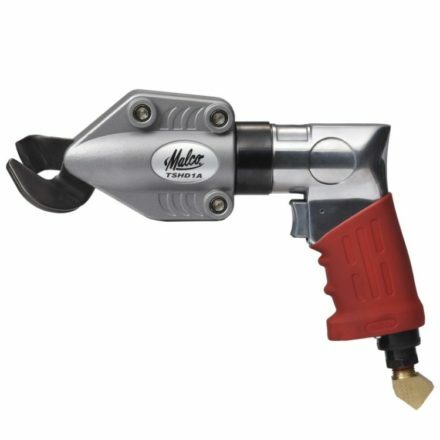 This one-hand operation accessory quickly inserts into the chuck of a corded or cordless electric drill and requires less force than other slate-cutting methods. Smooth, easy one-hand operation always leaves a free hand to steady the work when making cuts on a bench or rooftop. An operating speed of 1400 to 2000 RPM ensures optimal performance and control for making fast straight, angled or curved cuts in 4mm to 8mm natural roofing slate. Cutting slate with finished side up produces an authentic-looking, hand-cut appearance, and a padded skid plate prevents scratches to the exposed slate finish. Cut thousands of linear feet of roofing slate quickly and easily all season long! You can even rotate the tool’s skid plate to maximize acceptable cutting life. And the long-wearing blade and skid plate are also easily replaced on the job. A sleek, lightweight aluminum cast shear head and molded drill clamp allow maximum portability and ease to go wherever the work is. The patented compact telescoping drill clamp adjusts to fit both length and width of the drill housing including smaller bodied impact drivers. Optional spacers are stored on drill for large motor housings. A clamp collar allows the shear head to be rotated 360° and set in any position for optimum tool clearance or to facilitate easy material flow.